For so many years now the top flight football in England could be decided by goal difference. 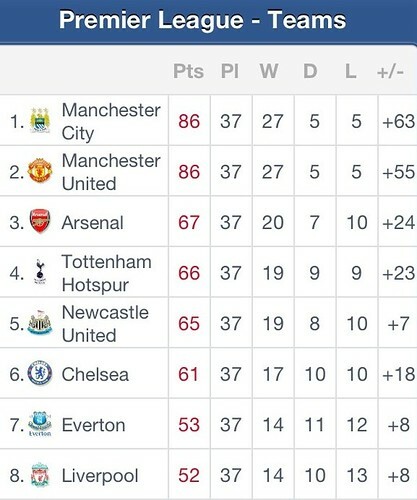 Both Manchester clubs are tied at 86 points with City having the advantage of superior goal difference. On this final game of the season, Manchester United is away at the Stadium of Light, Sunderland while Manchester City it at home to Queen Park Rangers (QPR). QPR is fighting to avoid relegation, so, there's everything to fight for. If both Manchester United and Manchester City win today, City will be crowned Champions for the first time in 44 years. As a strong United supporter, I really want this to by their 20th league cup - a new history in English football - but if they fail, I really think they lost it not today, but way back a couple of weeks ago when they threw away a 4-2 advantage at home to Everton. They ended 4-4 in that game. Never say never. Like Sir Alex Ferguson said everything can happen in football including "stupid" result at Etihad Stadium.